The City of Osseo is very excited to announce that we have partnered with The Beard Group to break ground on a new 71-unit, market rate, apartment complex on the Block 6 redevelopment site. The Beard Group expects to break ground in the summer of 2013 on the project, which will be located just north of City Hall, between 5th Street NW and 6th Street NW. The complex will include a wide range of apartment sizes (from studio to 3-bedrooms), include underground heated parking, community amenities (such as a community room and community outdoor patio), and high grade finishes throughout. The project will be broken into two phases. Phase 1 will involve the 71-units planned on the western half of the block. Leasing is expected to commence in the summer of 2014. The apartments will be market rate units and include high end finishes throughout. 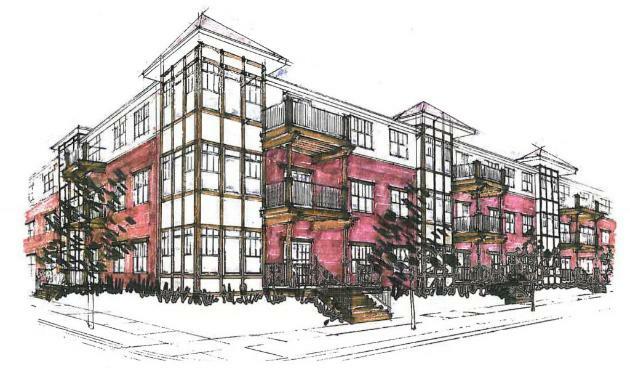 Phase 2, expected to begin in 2015, will extend the building all the way to Central Ave, adding another 40 to 50 units. The construction of the apartment complex is in reaction to a very strong rental market, as well as some nearby commercial development which will bring thousands of new residents to the northwest metro area. The Beard Group expects to move forward with Phase 2, given the already strong support for the initial phase of the project. For more information on the project, please visit www.discoverosseo.com, under the What’s New section, or contact our staff at City Hall. 1) Osseo is smack-dab in the middle of two very large communities in the northwest Twin Cities Metro area. To the east is Brooklyn Park and to the west is Maple Grove. Both cities boast populations of 60,000 people each. If you are looking for customers, they are all around us! 2) The landlords in Osseo offer very competitive and affordable lease rates. Compare them to Main Street in Maple Grove or downtown Brooklyn Park and you will find there is more value per square foot in Osseo than almost anywhere in the northwest metro. 3) Build your own facility on one of the existing properties currently available through the Osseo Economic Development Authority (EDA). Need more than one lot? The EDA is eager to work with developers to find the right-sized parcel for your business. 4) Buy an existing facility and remodel it to your liking. Osseo has a few existing properties and buildings just waiting for someone to come up and upgrade them. If you don’t see any ‘For Sale’ signs, stop by City Hall and talk to the staff. They always know what is happening around town. 5) Everybody knows your name – Just like when you were a kid, Osseo is that small community where people still walk instead of drive and pause on a street corner just to chat and catch up. If you spend any amount of time in this quaint community, people will know your name! 6) Work here…live here. Active development projects are bringing more and more people into town every year. Apartments are filling up and houses that go on the market sell quickly. Is your family looking for that perfect neighborhood to call home? It’s waiting for you here in Osseo. Excellent community services and a thriving school district make Osseo an ideal place to raise a family. Starting a business in Osseo is easy and affordable. Just stop by City Hall and talk to our staff about how to get started. Bring your ideas, strategies and, of course, your business plan. Start your business in Osseo and be part of a community where everyone knows your name!